Typewriters, used to print ink on paper or other media, were very popular instruments from the late 19th to late 20th centuries. The first known practical model of typewriter was invented by Christopher Latham Sholes, Samuel Soule and Carlos Glidden in 1866, but since that time several other models have been created and put to practical use. A keyboard typewriter is the simplest kind of typewriter, functioning from the QWERTY formation of letters and having a type (a metallic cast with letters molded into it) that's attached by a bar or rod. Examples of the keyboard machine typewriter are the Remington 2 and the Corona Portable's Animal Keyboard. Single-element typewriters enable the user to print data in different languages or fonts. Instead of using a bar mold for the type (called a type bar), single-element typewriters use type wheels, type sleeves or type shuttles for molds. The most popular single-element was the Hammond type-shuttle typewriter produced in 1884. Type-bar typewriters, as the name suggests, use type bars, or molds of iron shaped like bars, for their types. Type bars are the most common kind of typewriter and the original invented by Sholes, Glidden and Soule was a type-bar typewriter. Derivatives of the type bar are denoted by the way the keys strike the type bar. The grasshopper model performs an odd action by seeming to jump forward to hit the platen on the type bar, while downstrike models strike the type bar by swinging down from the front. Index typewriters were far less costly in the pre-modern era, but also less useful. An index typewriter required that users first input what key they would like, and then perform another action (usually pressing a lever) to print the letter to a page. Usually these didn't use type bars, but instead type wheels, type shuttles, type plates and even more novel types. Examples of the index typewriter are the American Visible, first manufactured in 1901, and the French Virotyp of 1914. Sometimes simply called teletypes or teleprinters, teletype typewriters came on the scene in the mid-1950s and peaked in popularity in the 1960s. They were used mostly for communicating information from point to point, much as modern fax machines are used. Most non-IBM computers had teletype terminals. Teletypes were completely mechanical and thus required regular lubrication; they didn't have type bars in the strictest sense and instead used plastic gears to print messages. The most modern typewriter, still used today, is the electric typewriter, most notably IBM models such as the Selectric. The electric typewriter minimized the force necessary to print out a message by using a motor and type ball to print letters on paper. 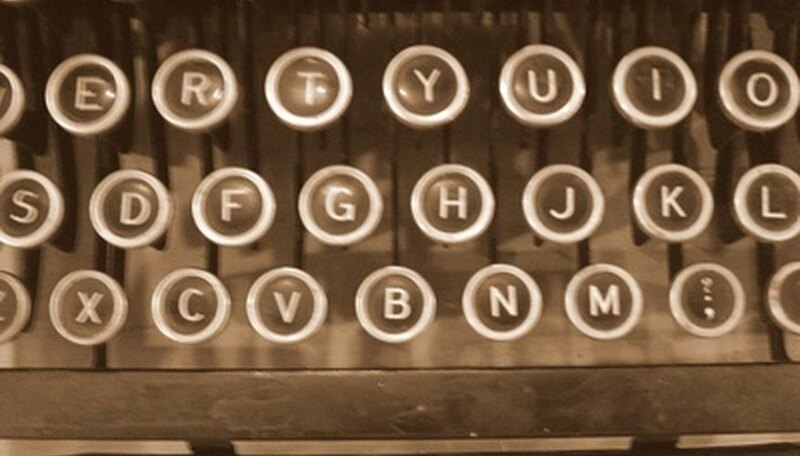 All About Antique Typewriters: How Many Different Kinds Are There? How Does a Typewriter Work?